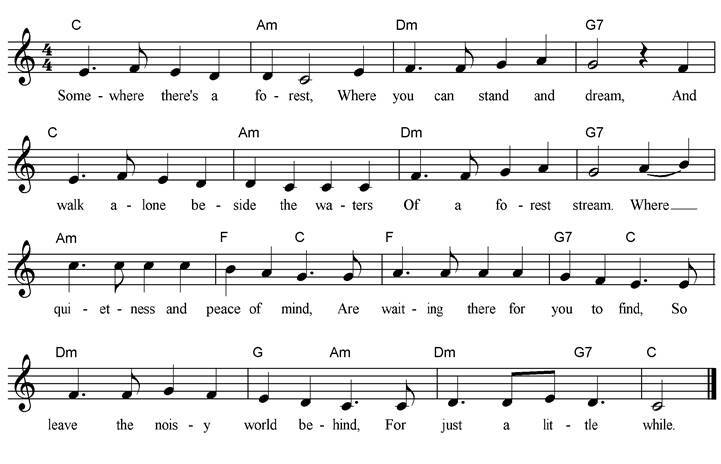 This lullaby is based on John Bell’s Peace version of the traditional song of the same name which included the line ‘It was Willie what got drownded’ sung by Odetta and Pete Seeger among others; we knew it well in the late 1960s. The third verse is written by Dany Rosevear. And o’er the deep blue sea. 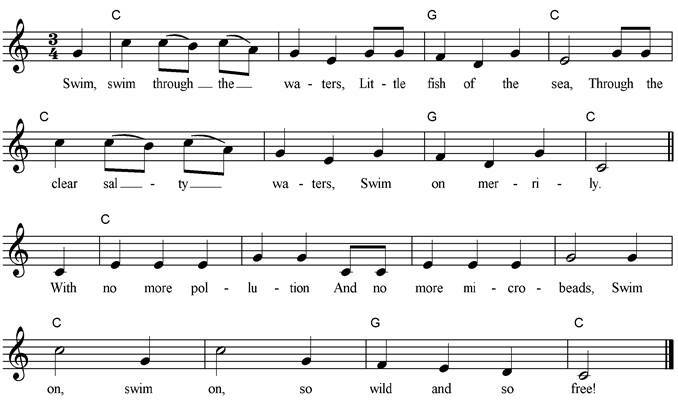 This lullaby was originally a hymn. I have adapted it to reach a wider audience and to encourage older children to consider how we can care for the wonders of our world and our place in it. There are, twinkling in the skies? Every day go drifting by? Would we miss one should it fall? Precious little star of the night. Precious wonders of our world. Precious little child of the night. 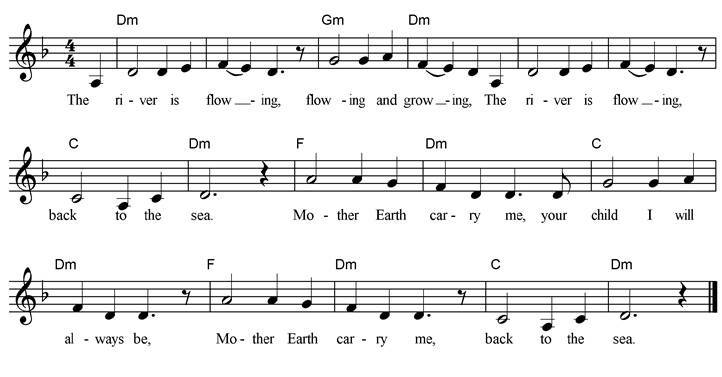 A greeting song to help children understand how we are all interconnected and part of a wider entity. Make up verses to include parts of the natural world around your own setting. 1. Touch ground. 2. Make circle above head with arms. 3. Place one hand curled on the other. 4. Open hands round face. 5. Cross forefingers and fly. 6. Cross hands at wrists and fly. 7. Open arms out then cross arms to chest. And the flowers every one. What would our world do without worms?! A song with swing by Patty Zeitlin. Words and music by Sarah Pirtle, © 1979 and 1989. You will find many other delightful versions of this song on the internet as Sarah has encouraged others to make up verses meaningful to their own lives. You will also notice differing interpretations of the music. Move with imagination; the video will give you some ideas! I am the river rushing to the sea…. 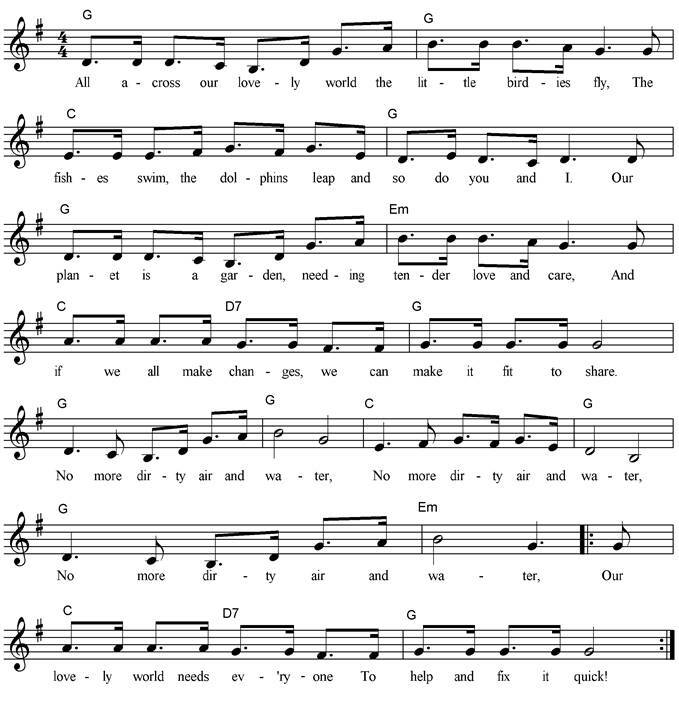 This song is based on Pete Seeger’s ‘One man’s hands’; other words of protest for good causes have been attached to this wonderful song over many years. 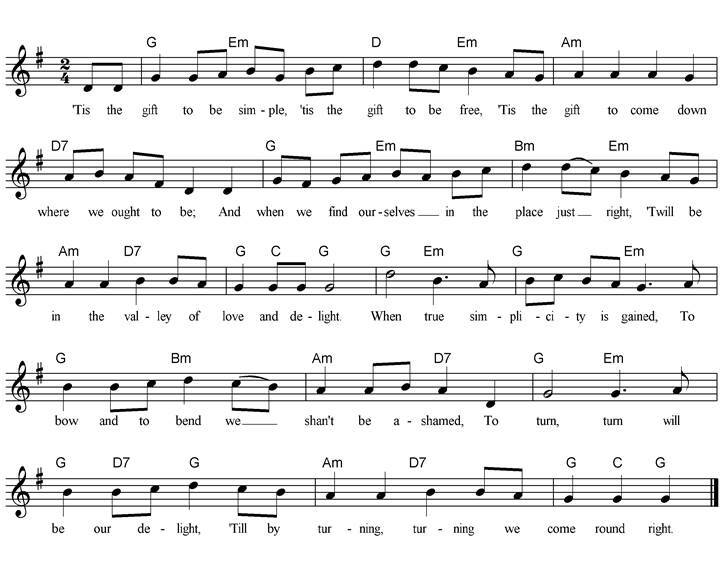 It was Marilyn and Paul Wilson’s version written with Wren choirs in Devon that caught my imagination. 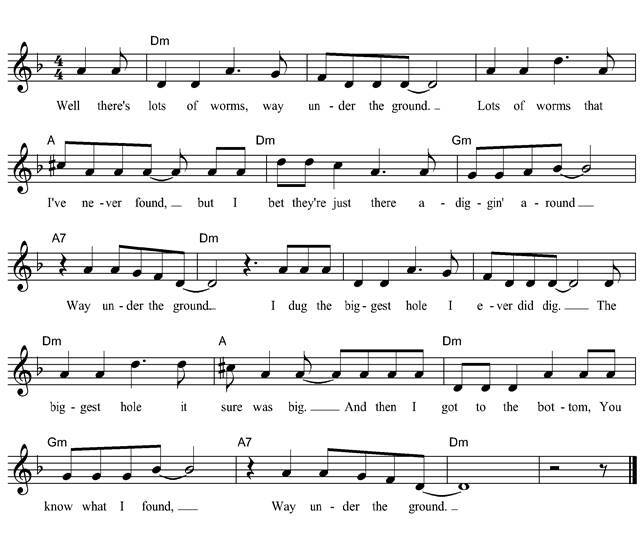 The words for young children here are written by Dany and Alan Rosevear and the music adapted and arranged by myself. Show both hands, shake finger. Wave hands. Chorus: Show hands, point to self. Then we can surely change the world. Everyone making small changes can make a big difference. 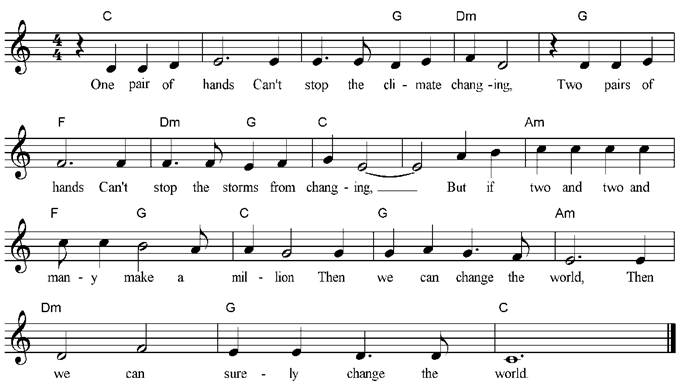 Written by Dany Rosevear as a request from a preschool for a song about climate change. We are never too young to consider what we can do to make a difference to the future of our home called Earth. Line 1. Sweep out hands, cross hands at wrists and flap. 2. One hand on top of the other with thumbs out, make hands dip and dive. Point to others and self. 3. Shape a ball, put hands to heart. 4. Throw out hands. Chorus: Wag finger. Stamp three times and hold nose. Beat fists three times. Verse 2. Hold arms and shiver, prowl, forefingers to mouth, shake elbows, hands to head with fingers outstretched then as before. Verse 3. Make hands and arms into trees, hand to ears, scratch armpits, wave arm for trunk then as before. The fishes swim, the dolphins leap and so do you and I. And if we all make changes we can make it fit to share. To help and fix it quick! The walruses, the penguins and the reindeer have a home. Monkeys screech, and elephants, oh, how we love them all. Little things that we do can make a difference to the health of our precious world. Another song written by Dany Rosevear as a request from a preschool for a song about climate change. The tune might be familiar to young children as ‘Miss Polly had a dolly’. Encourage children to add their own ideas for making our world a healthier place to live. NASA has a great site for kids to learn more about the environment and ways that they can help effect change. Verse 1. Wipe tears. Throw out hands. Tap wrist put fist under chin. Knock three times on forehead. 2. Rock arms. Stretch arms above head. Hands to heart, twist tap. Clean teeth, turn tap. 3. Waggle then shake finger. Put up one finger at a time. Shake finger. Use thumb and forefinger to indicate little. 4. Throw out hands. Mime switching off light and cyling. Dig. Show one then two trees with arm and outstretched fingers. Throw out arms, point outwards then to self. 5. Hands to cheek. Rock arms, then as before. How can we save her quick, quick, quick? And knock on our noddles with a rat-a-tat-tat! Poor planet Earth says, “Please take care of me! Wake up now to save my land and seas. And when you clean your teeth turn it off like that! Tell us planet Earth, what else should we do? I first came across this song in the 1960s; the delightful tune became a very familiar one in school assemblies as ‘Lord of the dance’ by Sidney Carter. 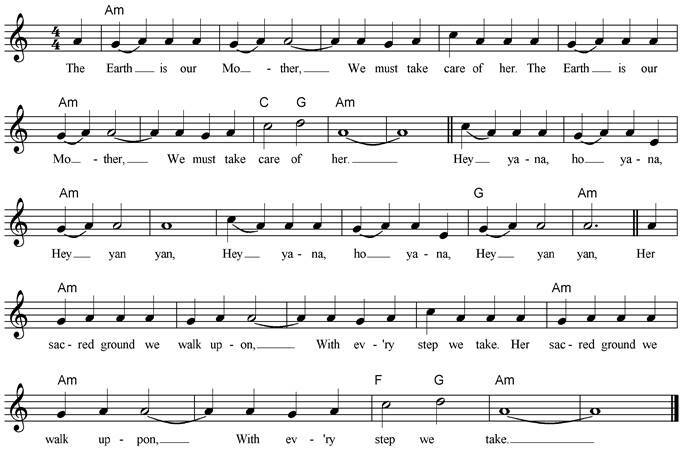 I added it to my class music collection from a BBC Publication ‘Singing Together’ Spring 1974 to where it was described as an American ‘Shaker’ song; I have omitted the second verse as it was not in the original version. We all need our moments of peace and fresh air. This song was written by Susan Stevens and appears in the ‘Our chalet songbook’ published in 1974 and then ABC schools ‘Sing!’ 1995. As another day is born. A wish for our world's waters. What are you doing to help keep our oceans fit for the future? A song to encourage a discussion of how we, in our small way, can make a difference to the survival of the creatures and species we love. So our oceans can thrive. Appreciate what we have and make the most of our natural world. 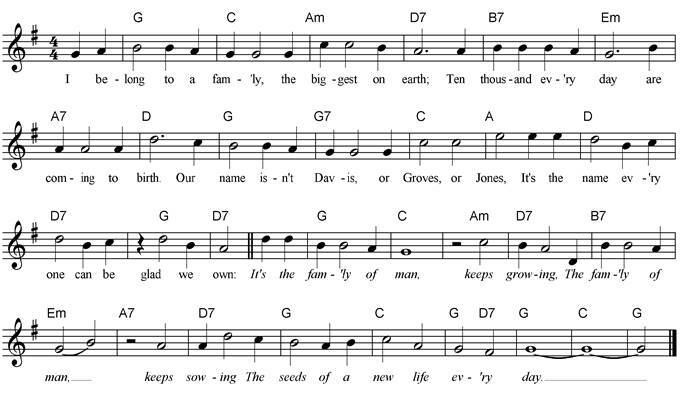 Written for the 1927 musical ‘Good News’ with lyrics by Buddy DeSylva and Lew Brown and music by Ray Henderson. 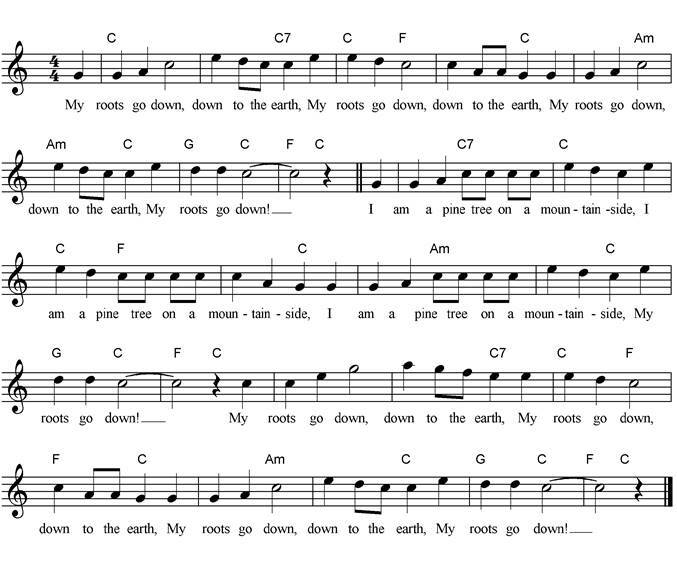 There was a revival of the song in the 1950s by a number of well known singers. Find out more. A song for our times - together we can make a difference. Words and music by Karl Dallas. 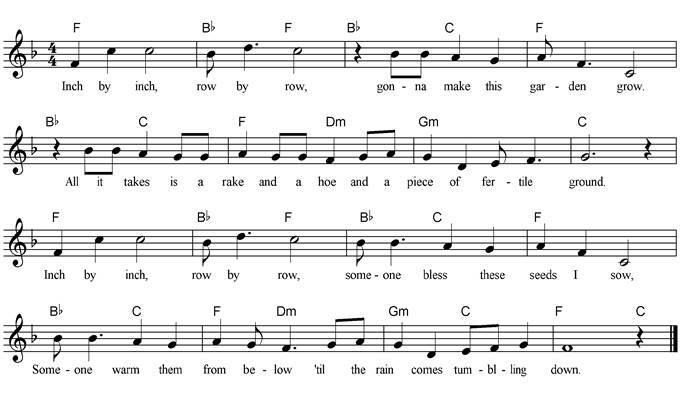 This song from ‘Come and Praise’ BBC radio for schools, was very popular in assemblies all the years I taught and always sung with much gusto. The second verse resonates very personally as my larger family is spread around the world including Perth and Paris! I have very gently tweaked some of the less contemporary words and replaced them with more inclusive language; deleting ‘coolie’ and culling ‘men’! Though the ‘man’ of the title of course refers to ‘mankind’. I love ‘The miner in the Rhondda’ / but if you wish to be more up to date sing ‘The miner in Wyoming’ as most coal is produced there. Ten thousand every day are coming to birth. The seeds of a new life every day. The whole wide world is mum and dad to me. Just found this extra verse! This is where our garden’s found. Side by side we work the ground to help these seedlings grow. Trust the promise that we share. Keep them healthy and prepare for our ﬁrst fruit to show. 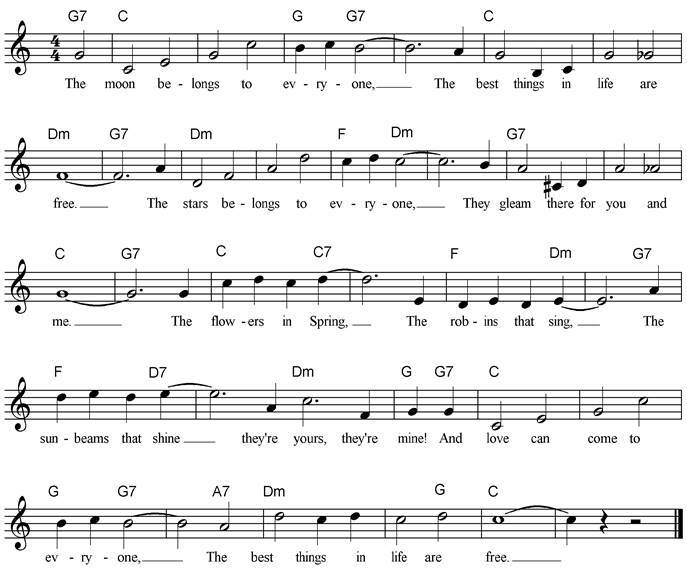 The source of this song was probably a chant written in the 1970s by Sun Bear, a member of the Chippewa Tribe. He was born in the White Earth Reservation in the North of the United States on 31 August 1926 and died on 19 June 1992 at the age of 66 in Spokane, Washington. 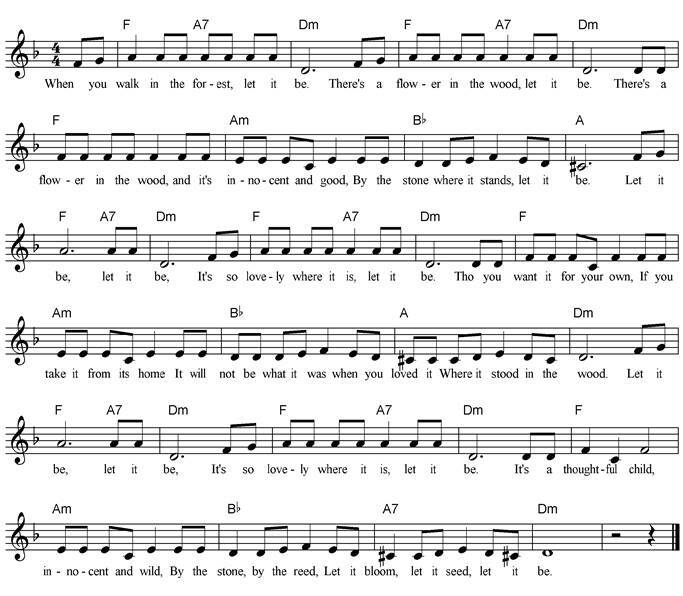 Additional verses have been added over the years and you can find several interpretations of the melody. Find more at: http://www.soulrebels.com/beth/riverflowing.html and http://mudcat.org/thread.cfm?threadid=7568. I have adapted the words of the final verse to lament a changing world and hope for the future of our children. Sister Moon watch over me, until we are free! The sun he is shining, lighting our way. Father Sun shine over me, until we can see! The earth she is changing, her waters are tears. Mother Earth carry me, down through the years.